Parliament continues to reel from the dizzying events of the past 5 days, the likes of which are virtually unprecedented in Canadian history – not to mention downright entertaining. Finance Minister Jim Flaherty unveiled what was billed as an “economic update” in Parliament last Thursday – a plan placing limitations on the public service’s ability to strike and offering little in the way of economic stimulus – that was met with loud derision and cries of disgust at Harper’s arrogance and calls for a confidence vote in the House. MPs from Canada’s other parties – Liberal, New Democratic Party and the Bloc Quebecois – stated they would refuse to vote this update into law, forcing Harper’s Conservative government into a confidence vote that would surely defeat them. What angered the opposition most was Harper’s – via Flaherty – blatantly partisan slam tucked inside the update that would see an end to federal funding to political parties, a Conservative Party attempt to weaken the opposition parties in light of their tenuous financial positions and render them less able to mount a strong election campaign down the road against Harper. MPs cried foul that Harper would be playing partisan politics with a piece of legislation supposedly designed to help Canada’s ailing economy. Immediately, political and economic analysts across party lines conceded Harper had committed an egregious error in judgment at worst and a serious political misstep at best, a blunder very likely to delay much-needed economic restructuring at a time when Canada needs it most. Despite head-spinningly quick reversals by the Conservatives on many of the update’s key points – a move designed to placate the furious opposition MPs – the dye was cast and leaders Stephane Dion, Jack Layton and Gilles Duceppe began talks to form a coalition government, with Dion assuming the role of Prime Minister and the parties assigning Cabinet positions weighted in favour of the Liberals and the NDP. Fast forward to today where Governor General Michaelle Jean is flying home from a truncated European speaking tour to address the national crisis. Her role will be to weigh the options before her and determine the fate of Parliament. Experts seem to agree that one option would be to grant an anticipated request from Harper to prorogue or suspend the current seven day old sitting of Parliament, presumably so he can avoid a confidence vote and have time to prepare a budget, although this contains some problems in that there is no precedent either way for such a request under these circumstances and many believe she will not prorogue simply to allow the government to avoid a confidence motion. The second option might be to grant a potential request from Harper to dissolve the current sitting of Parliament and call a federal election – an unlikely and unattractive alternative considering Canadians just went to the polls 7 weeks ago and voter turnout was extremely low. Jean’s third option would be to entertain the request of the Coalition members and allow them to form a government, under strict conditions, for the remainder of the term. Canadians are understandably concerned. Conservatives who voted Harper’s people into power are furious, claiming – as Harper said himself – that the Dion-led Coalition is trying to take power without earning it. Perhaps, but the Conservatives might want to drop the smug rhetoric and accept that only 37% of voting Canadians elected the current government and a Coalition would actually represent the 63% of Canadians who voted for someone other than a Conservative MP. Enter Gilles Duceppe. Critics of the potential Coalition are crying “deal with the devil” at the Coalition’s inclusion of Duceppe’s Bloc Quebecois, convinced the pact will give too much power to a man the fear-mongering Harper believes would separate Quebec from Canada. What Canadians need to understand is that Duceppe wants sovereignty for Quebec, for it to be recognized as a distinct society and receive appropriate benefits, but there is little in his rhetoric over recent years to suggest he is for cutting all ties and looking to create the separatist nation of Quebec and become President Duceppe. Duceppe is more about left-wing activism than separation – both of which frighten Harper – and it his left wing ideologies that enable him to enter and welcome him into this Coalition. Once again, Harper is appealing to the fear of the unknown in Canadians – first, it was fear of how a non-Conservative government would lead Canada in these tough economic times, times Harper refused to acknowledge were bad until intense media pressure forced him to. Second, Harper instilled fear of a Stephane Dion-led Canada, a very intelligent man Harper’s attack ads so thoroughly shredded the country was unable to see that this man, while lacking charisma and a slick, articulate style in English, has the smarts and love of this country to lead us through uncertain waters. Dion has acknowledged he will not continue to lead the Liberals, but he will be the Prime Minister under this Coalition until the Liberals hold their leadership convention in June. By accepting the leadership role in this Coalition government, he obviously fully understands this is not the way he ever wanted to become Prime Minister. 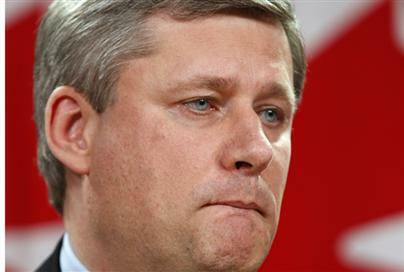 He knows he took a serious drubbing and he is not the leader Canadians wanted in the last election. The Liberal party itself is allowing Dion to stand as leader because the leadership candidates don’t want a rushed selection, nor a leadership candidate with a leg up heading into a leadership convention. Dion and the Liberals know Dion is going nowhere as leader and that is why he will stand for now in what is clearly a rather thankless position. There are those who accuse the Coalition of political opportunism and putting their quest for power first above the good of the country, and at first blush, it’s an easy position to take. To them, I say this: Who would you like to lead Canada? A man with his head so deeply buried in the sand that he misjudges the needs of Canadians and Canada or a group of committed public servants willing to put their partisan policies aside and work together in a coalition to run this great country the way it should be and not according to policies based too deeply in neo-conservative ideologies? Watch for Harper’s own party to become angrier and most mutinous by the day as they realize his mean-spirited bully tactics have amounted to throwing the whole Conservative government under a bus. Enough with the Sweater Vest, Already! Stephen Harper thinks Canadians are stupid – really stupid. He thinks we look at him in his warm sweater vest, hugging Asian babies and huddling around immigrant kitchen tables and believe that he’s changed, that he’s just like one of us, down there in the trenches, eking out a living. But, he’s not one of us. He is an arrogant, hypocritical opportunist determined to tell you and I what we need in government, what we need in our lives and what we need in our country – and he will only tell us these things through carefully scripted, painstakingly researched bites screened through his office by his people. Heck, even his people can’t actually speak for their own campaigns, as we saw this week when Surrey, BC Conservative candidate Donna Cadman was muzzled by Harper staff at a function in her home town. Are Canadians buying the fatherly schtick Harper puts on – and he doesn’t even do it well – while trying to hide his true Machiavellian, Big Brother, neo-Con mish-mash of an agenda? One wonders when poll after poll show the Conservatives in a comfortable lead – how is this possible? Harper is uber-intelligent, no one doubts that for a moment; he is a policy and process wizard. But where he falters is in trying to sell his regular guy image to a country he runs under the assumption his subjects are all far too stupid to understand the issues or manage the country themselves. Even when he lies to us – as on October 31, 2006 when Federal Finance Minister Jim Flaherty announced new taxes on income trusts for Canadians in clear contravention of a Harper election promise not to tax the investment vehicle – he tells us we need it this new way. He flip flops his way through election promises: a Ford prop up here, stricter environmental penalties there – ooo, say five dollars per indiscretion, up from three for corporate polluters? – a “tougher” Youth Criminal Justice Act there, a jab at members of Canada’s vibrant arts community who apparently attend too many fancy galas for the liking of a PM who looks like he’s known more “tax-payer-subsidized” buffet tables than Kirstie Alley. And all for what? Canadians – even those who might vote Conservative and could be considered politically stupid or unsophisticated – wonder what Harper really stands for, or, more accurately, will he ever reveal his true agenda? He says – like most politicians – what he has to in order to get elected, then disregards it all and gets down to serving up the real Conservative menu of law and order, militarization, globalization, and – oh yes, let us not forget – bowing and scraping at the feet of the American neo-Con movement and its unfortunate government of the moment. The American cruise missile, whose tail to which Harper has so firmly attached Canada’a fortunes, is about to crash, as evidenced by John McCain’s numerous blunders this week culminating with his latest announcement that he will suspend his campaigning in order to go to Washington and help George Bush sell his woefully misguided economic bail out plan to increasingly dubious taxpayers. McCain apparently thinks Americans are stupid, too and that might not be working for him. There are choices, Canada – Stephane Dion and Elizabeth May don’t seem to think we’re stupid. Now, if we can just work out a way to join forces to beat Harper’s machine, we can move on to the business of fixing our economy, our environment and our arts and social programs. Are we smart enough to do it, Canada? Green Party leader Elizabeth May comes out swinging as national broadcasters deny her a seat at the nationally televised October 1 & 2 Federal leadership debate. A consortium of television networks claimed Stephen Harper and Jack Layton threatened to boycott the debates if May was included, citing Harper’s concern that May was acting in support of the Liberals – an accusation that sounds eerily reminiscent of Layton’s New Democrats propping up Harper’s minority government for the past year. Apparently, Bloc Quebecois leader Gilles Duceppe did not threaten to boycott, but did express his desire that the debate include only leaders of the four major parties. Stephane Dion stated he supported May’s participation, but would not take part in a debate if Harper were absent. Perhaps the broadcasters should have called Harper’s bluff – do they really think Mr. Bully would sit out a “leaders'” debate? This is a guy that wouldn’t miss a board meeting of the Calgary minor hockey association. If no one showed, who would that look the worst on? The sheer lunacy of May’s exclusion at best makes very clear the priority national media and the Conservative government place on environmental issues and the imminent crisis that is global warming – at worst, it points to the very real existence of a deeply-rooted intent to back-burner the environment indefinitely in favour of protecting the oil and gas industry and Canada’s other manufacturing interests. While May seeks legal counsel, the national broadcasters will no doubt scramble to come up with a more palatable, less actionable reason for the Green exclusion, mindful of the fact that in the last Federal election, May was excluded from the leadership debate because the Greens did not hold a seat in the House – a situation rectified when former Liberal and Independent MP Blair Wilson crossed the floor to join the Green Party as its first member of Parliament. That May should be allowed to participate is undeniable, but beyond the obvious democratic, sexist and free speech implications, the issue raises a serious concern about whether the responsibility for the survival of the planet should be entrusted to our elected officials. The future of the earth should not be a mere politcal football to be tossed around, carbon taxes initiated, then withdrawn at the whims of parties trying to win favour with the loud SUV-driving, me-first, world-second lobby. The newly-formed non-partisan group Canadians for Climate Leadership brings together high profile leaders from the environment, business, science and academia to demand the federal government do far more than pay lip service to climate change. This group includes former Prime Ministers Kim Campbell, Joe Clark, Paul Martin and John Turner, as well as respected Forest Ethics activist and spokesperson Tzeporah Berman and Nova Scotia businessman John Roy, a long-time supporter of green business practices and sustainable development. The groups draws deeply from a large number of people committed to change. Canadians for Climate Leadership is the first group in Canada to being together power players from sectors that could actually effect change and lobby the government in meaningful and powerful ways. They will be launching a timely campaign tomorrow called PowerUP Canada, designed to enact tough domestic laws and provide Canadian leadership in the drawing up of international agreements on controlling green house gas emissions. Regardless of who moves into 24 Sussex Drive, the first order of business in Parliament for the new government should be to sign over every decision regarding the environment and the regulation of green house gas emissions to the Canadians for Climate Leadership. They are far better-suited to make the tough choices and accept the fallout than any of our political leaders who really, really, really want to do something for the environment, but people just get so mad at carbon taxes. Enough lip service.